Check out this map of proposed Citi Bike stations for Bed Stuy, as part of DOT’s plans to expand the bike share program further east into the neighborhood. There are nine existing Citi Bike stations from Classon to Nostrand, between Flushing and Atlantic. The expanded boundaries go from Nostrand east to Lewis Avenue, between Flushing and Fulton. There are stations proposed outside of the Kingston-Throop C station, near the Mytle-Willoughby G station and near the Flushing Avenue J/M station, as well as many other spots throughout the neighborhood. According to this DNAinfo article, there will be a total of 26 new stations which the DOT expects to install by the end of this year. 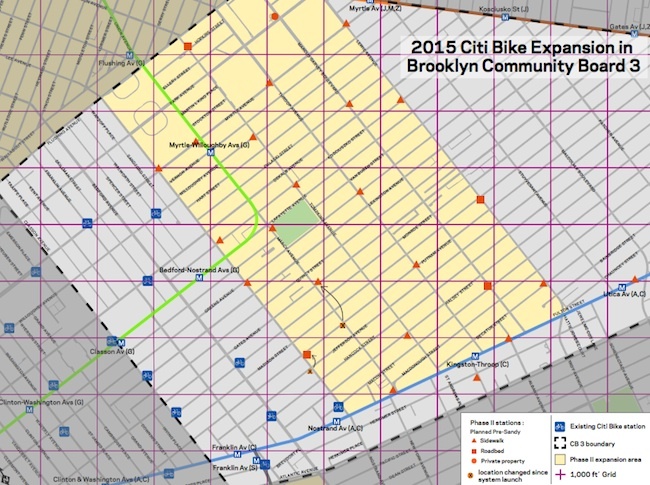 Do these locations look good to the Bed Stuy bike riders out there? The map looks very comprehensive to me. There’s also one outlier on Malcolm X and Fulton to accommodate those exiting from the eastern end of the A/C at Utica. This is very cool, I’m happy. Unfortunately, if you check the suggestion map, it does not reflect the actual demand for bikes. There seem to be a lot more requests by the JMZ line(s) – I guess mostly from the Bushwick crowd. Oh well. It just feels like the bike map is the result of a similar process. I might be wrong, based on my very limited interaction with CB3. that might have sounded a bit too negative.